LMAO. So true to a group of pathetic [white] guys who are always playing defense!!!! We all know their motivation is FEAR. Fear of losing power, money, control of the “little” people, and THEIR inalienable [birthright] of being born Caucasian. Canada is that cousin your mother says you should be more like. heh I like that one! Some of them also speak French. We should be very suspicious of anyone who speaks one of them foreign languages — especially French. 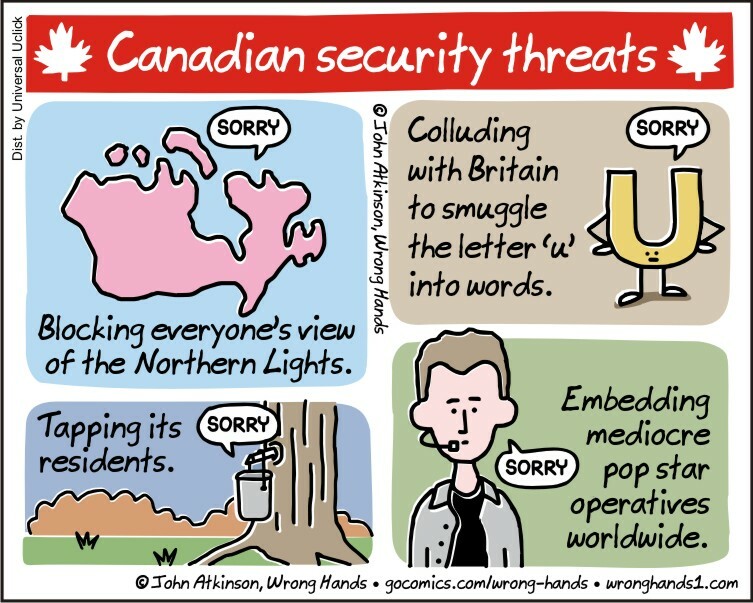 (But I’ve gotta agree with you that blocking the Northern Lights is their #1 aggression, and totally inexcusable.) HAHA! Now I have to apologize cause as a non-native English speaker I sometimes don’t get the jokes right away – thanks for clearing this – I am glad it’s this way! I, a Canadian, fully approve. Glad you like our brand of passive aggression eh. Top notch material, John. I so love and need this humor. I am grateful to have found this place. I must apologize for my negative reply. That is not who I am. I do not enjoy these unhealthy emotions and must let them go. And laughter is truly the best medicine. I apologize fellow inhabitants of our planet. I envelope myself with these gifts of laughter and release any cynical emotions that try to harbor inside me. Grasias amigos. I’m glad I could help in some small way. We inhabitants of the planet Earth are a resilient bunch as history has proven. Hang in there and keep smiling!